STEM Community Ambassadors supports local community adults in leading programs in their neighborhood by immersing the Ambassador in the world of connected learning while empowering them to provide a critical perspective during program development. 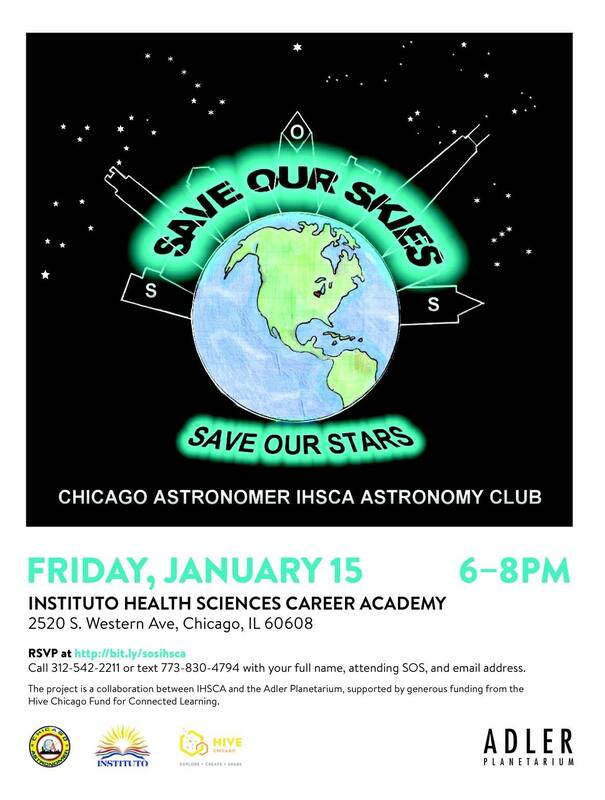 On Friday, January 15th, 2016, the youth astronomy club from the Pilsen/Little Village area will be empowered to facilitate activities and bring awareness about Chicago’s light pollution to the community at their high school, Instituto Health Sciences Career Academy. They are gathering data via light meters, learning how to build a Do It Yourself All Sky Camera, and learning how to utilize lighting properly while bringing professionals to speak about their experience with light pollution. This is an ongoing project and hope to bring other youth in the Chicago area to assist in helping how to better see our stars. Iridescent’s pilot is a collaboration with the Logan Square Neighborhood Association (LSNA) at their McAuliffe Elementary site in Logan Square. Our STEM Community Ambassadors are two parent leaders at the school who are involved in LSNA’s parent mentor program. Iridescent trained the Ambassadors to plan and facilitate family STEM workshops that focus on building engineering design challenges from Iridescent’s online platform, Curiosity Machine. In planning, the Ambassadors used Iridescent’s model for family science workshops and adapted it for their community, including translating the workshop content to Spanish. At the first workshop in December, the Ambassadors led a group of parents and children through the engineering design process to build their own Air-Powered Spinning Machines. A second workshop with a different design challenge is planned for January. This project seeks to improve our ability to incorporate parent and community voice in out-of-school time learning spaces. Community Ambassadors will dedicate time, not only to learning the STEM content and bringing programs to youth, but also to gaining a deeper understanding of the practices of the host organization while bringing the host organization a key stakeholder perspective for improving that organization’s approach to youth outreach. As embedded members of the host organization and with a strong investment in their own community, the Ambassadors will bring increased knowledge of youth opportunities to the neighborhood at a grassroots level. Outcomes: - Project partners will identify critical components to involving parents and/or community leaders as integral parts of program development and outreach - Community Ambassadors will demonstrate increased knowledge of connected learning principles and digital media technologies - Community Ambassadors will increased knowledge of youth programming offered by the project partners and across Chicago - Community Ambassadors will demonstrate increased interest in seeking out other opportunities for neighborhood youth - Youth participating in Community Ambassador programming will demonstrate increased participation in STEM programs, either in person or online through the Chicago City of Learning Outcomes will be measured through interviews and surveys with the Community Ambassadors and reports from partners during the course of the project.